The comment is not documented. No discussion about what she meant by it was had and she went back to her nursing home. The next week she’s back again very poorly, not eating and drinking and we start the whole process all over again. Working in an emergency department I feel very privileged to be involved in the care of many different people. I get to put tubes in people’s chests, I give people anaesthetics, paralysing them and helping them breath, and that is professionally satisfying. I like pulling at a broken bone and I like putting the plaster on it to keep it straight. They make me feel like a doctor. It’s great. To make a difference to someone, to heal, this is why we do what we do. However, sometimes I can’t fix what is broken and that can be a frustration. That feeling comes with increasing frequency and when I can’t do what I’m trained to do there’s uneasiness. Compounding that unease then is a need to have and open and frank discussion with patients and families about what lies ahead for them when we can’t heal. Explaining the pros and cons of a blood test or investigation is easy. I find discussing the futility of treatment harder. Getting advice from multiple doctors, perhaps even multiple specialties, in order to get a consensus decision; the right decision for the patient is paramount. Yet in spite of how difficult these discussions can be, I still find talking to families and patients about how poorly they are one of the most rewarding parts of my job and I make no excuses for shedding an occasional tear after doing it. These discussions are still hard for us despite having had many similar conversations in the past so I can only imagine how difficult it is for patients and families; trying to shape their loved ones care when staring at the sometimes bleak outlook that lies ahead of them. In recent years there have been a number of changes (certainly in the UK at least) to the process in which end of life care and treatment limitation is considered. 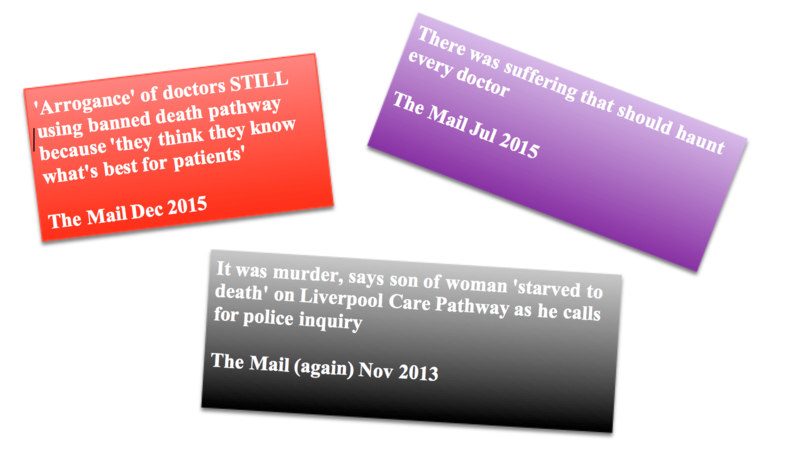 The much maligned Liverpool Care Pathway1 has been forced out (by a lack of understanding? misuse?) from health care professionals, pressure from families of loved ones wanting the best for their relative, and dare I say it by politicians and campaigns by terrible newspapers. For all of its problems, the one thing it did do was it provided an opportunity for clinicians to focus at least on the concept of caring for the dying patient. The sidelining of the LCP has led the way for other types of care plan. These are often a bit more individualised involving LOTAs (Limitation of treatment agreements) and unDNACPR (unifying do not attempt cardiopulmonary resuscitation) The LOTA form sets down the agreed ceiling of care in hospital. 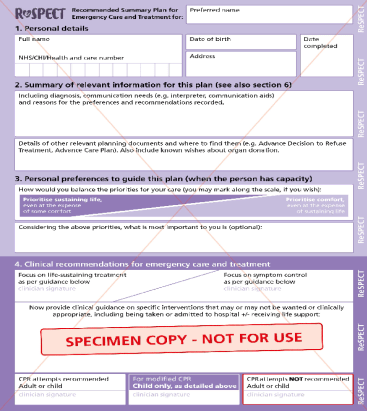 It’s completed following a discussion with the patient and family if at all possible and the DNR forms we use in the UK are transferable so they apply in the care home, in the back of an ambulance and in the acute hospital. We’ve used DNRs for decades and LOTAs for a number of years but something strikes me. Why are they the first form in the notes you come to? Don’t get me wrong, I think these two forms are very important. They give a quick summary of what not to do, but their placement front and centre makes them appear paramount and I don’t think this is necessarily the most holistic approach to care and can make the discussion about appropriate care difficult. My practice has often involved discussion about resuscitation and treatment very early on in a patients care episode, even if death is not imminent. That doesn’t mean that it is the most important part of our strategy to care for my patient, I do this simply to embed these decisions as a routine part of patient care. We are mandated in law in (quite rightly) to discuss these difficult things with our patients if possible but as alluded to earlier making these types of decisions in the heat of the moment can be difficult. 1. A conversation with people BEFORE they’re unwell was optimal for making the process work. 2. Being “known” to care providers was important as it gave patients comfort that the advanced decisions would be respected. 3. Early involvement of the next of kin and nursing homes might then avoid unnecessary paramedic CPR. 4. Elderly people were ready to talk about these things and they valued a system that helped them do this. There is a new initiative in the UK, ReSPECT. Here in Virchester we are about to “go live” on the project. 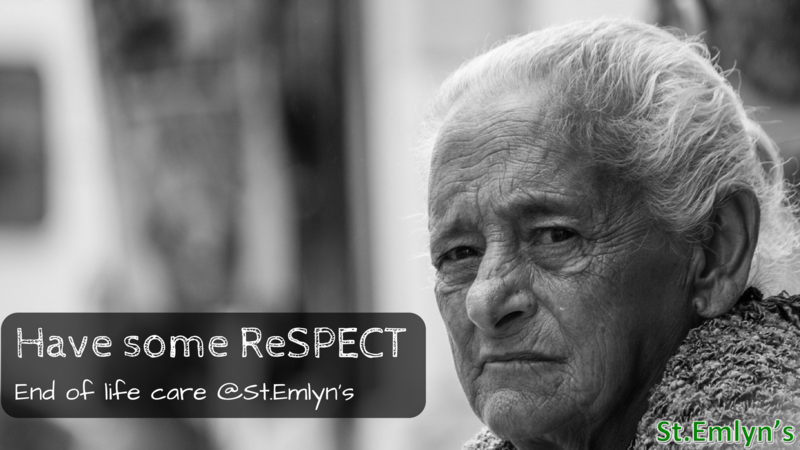 ReSPECT (no not Aretha) stands for Recommended Summary Plan and Emergency Care Treatment. It is a process (rather than just a form) in which a personalised recommendation of treatment has been made with the agreement of the patient. It’s designed to be used at the time of an emergency when the patient may be unable to express their wishes. ReSPECT is not just about death and dying but it appears to be a truly holistic approach to healthcare with decisions about many aspects of care being made. It has the backing of the Resuscitation Council UK, and our own Royal College of Emergency Medicine. In fact pretty much anyone who is involved with the care of patients from Macmillan to the Intensive Care Society has given their backing to the project. Legally binding is essentially the answer. Then again neither are unDNACPRs or LOTAs. In the UK we have legally binding documents called advanced decisions or living wills. ReSPECT would run alongside any advance directive decisions. How can you be ReSPECTful? This process involves conversations between patients and clinician. The clinician can be the GP but could be any clinician that is caring for the patient. It combines the patient’s wishes and clinical judgement to provide a set of personalised recommendations in emergency situations. It aims to document patients’ wishes not just for resuscitation but also for other life sustaining treatment which may be unwanted. The plan should be immediately available to ambulance crews and emergency physicians so that if we are unable to ascertain patient or family wishes at the time that we can still be sensitive to their wishes about care. Are there any issues with the form? Well of course there are, nothing’s perfect. In all likelihood (although not exclusively) these forms SHOULD be created in primary care ( I suspect many will be done in the ED). It is therefore up for debate how informed the process will be. A GP’s understanding of life sustaining treatments as they pertain to their patient may be different to the Intensivists when they’re stood at the bottom of the bed. What if a GP underestimates a patient’s chances in ITU? We may find ourselves advocating for a treatment the patient and GP have already decided against. Conversely a form advocating for a life sustaining treatment hospital clinicians don’t think is appropriate leaves us a difficult conversation to have again. This could create conflict at the bedside, but I’m sure we have all had the difficult task of explaining the futility of CPR to a family demanding it for their loved one. I don’t think that scenario will ever go away no matter what type of form we use. In fairness to the ReSPECT form it does attempt to mitigate for these situations by incorporating a review box allowing clinicians to update the form to maintain the validity of what is written on it. There are some practical issues with the form as well. First of all it is just a form… and not a very big one. There isn’t lots of space to document all possible treatments that may or may not be considered. Secondly, in the heat of the moment, the form could be simply left at home. Hopefully with increasing access to summary care records from general practice that may become less of an issue in the future. What’s great about the form? Remember that research Liz put me onto? It brings the conversation forward. Having a document outlining the care patients may want in the future is really important as it gives us as clinicians the ability to make the right choices for them if they lose that ability. It asks the patient how they want to prioritise their care. Do they want to prioritise sustaining life or do they wish to be kept comfortable? It considers care to be on a continuum and I like the idea of that. I think it gives patients to opportunity to express in simple terms how far they want to go and what are they willing to endure towards the end of their life. It does this all with reference to the clinician’s professional opinion on the types of treatment that may be beneficial and those that are not. There’s a box for important contact numbers, family members, consultants, GPs. Although a form is great, a conversation with relatives and clinicians could provide even more information and the contact section could be really useful in an emergency. There are boxes for clinicians to sign if they recommend CPR as well a box to sign if they don’t recommend CPR. I also like the fact the ReSPECT form specifically prompts clinician and patient to consider organ donation. As a result it feels like a positive plan, one which can and perhaps should be used in young people and children. Although the form isn’t perfect, I think it feels more holistic, more considerate, dare I say it “nicer”? Importantly I get the feeling that it will make the discussions more approachable, more normal and remove the anxiety that can accompany advanced decision making . This time she’s not come to hospital empty handed but clutching her ReSPECT form. It documents that she certainly doesn’t want resuscitation nor does she want prodding and poking with needles again. It says quite clearly that she wants to be kept comfortable if she becomes poorly. We call her emergency contacts who confirm this and we give her the dignified end of life care she wanted and deserved. Liverpool Care Pathway. British Gov. https://www.gov.uk/government/publications/review-of-liverpool-care-pathway-for-dying-patients. Published 2015. Accessed April 28, 2017. The ReSPECT process. Recommended Summary Plan for Emergency Care and Treatment. http://www.respectprocess.org.uk/healthprofessionals.php. Published 2017. Accessed April 28, 2017. Next: Next post: Mitchell’s plain, #badEM and my utmost respect. St.Emlyn’s. However, I don’t believe the conversation should begin with discussions about potential medical interventions on offer but starts with a general talk about the patient’s current quality of life and values. It should focus on the patient’s perspective of this and not on what others around them perceive or hope it to be. The lay public often have overly optimistic ideas about what medicine can offer particularly for those who are elderly and frail. They don’t understand that the prognosis from CPR is highly variable depending on aetiology. They don’t appreciate the significant and likely harms (and often poor outcomes) by taking an approach of ‘doing everything’. They can’t comprehend the indignity and suffering of intensive care. Most importantly, they don’t foresee in the unlikely chance they pull through, the stepwise deterioration in their already tenuous function during a protracted recovery period. Critical care for patients in the terminal phase of their illness is often an example of uninformed consent. So my introduction starts with getting to know the patient. Simple questions about what the patient is able to do, what ADLs can they manage and then what they enjoy e.g. hobbies, social activities. After gathering this information, I ask a very simple question, “Based on this, how would you describe your quality of life and do you think you are already suffering now?”. At this point, I will relate this to their chronic disease and overall mid to long term prognosis. I reinforce the point that their condition will continue to progress (not improve) over time. They should be given time to consider the implications of this on their future enjoyment of life. I then put this into the context of an acute illness that is potentially life-threatening that may also be a repeated occurrence. I talk abstractly about a continuum of approaches beginning with simple treatments resulting in minimal discomfort that may optimise their outcomes, to more intensive interventions that may marginally improve their chances of survive but have the propensity of increased discomfort. I constantly reinforce the point that regardless of what we do, that even if the patient’s survives their recovery will be protracted. Lastly comes the dreaded and now apparently redundant, ‘Do you want CPR” question. I talk about the possibility that despite anything we do their heart and breathing may stop and indicate that by this time the situation is very grave and that this intervention is highly unlikely to achieve anything except a brief un-dignifying end.